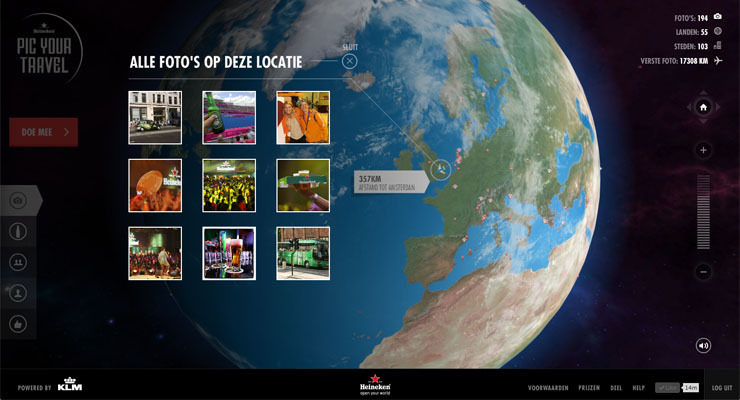 Together with TBWA\NEBOKO, Netherlands-based creative agency Superhero Cheesecake developed an upload-your-holiday-photo campaign for Heineken in The Netherlands. Taking inspiration from the social media photosharing trend, Heineken Pic Your Travel is a website where you can upload your holiday photo for a chance to win KLM tickets. You can upload through Instagram, Facebook or straight from your own computer. The website will automatically get the location of your photo or if there’s no data available you can tag the location yourself. After approval the photo is plot on a 3D globe. 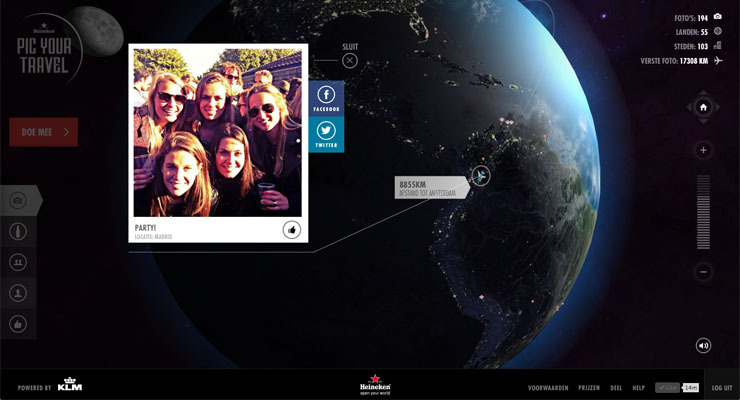 The globe is the primary navigation on which all uploaded photos are pinned as markers. If there are multiple photos for the same locations then these markers will become marker clusters that combine multiple photos into one marker. This kind of resembles Google Earth’s navigation. The globe itself animates: it has a cloud system and will change from day to night (based on local time). When you click on a marker a small plane will fly to that point from Amsterdam which is the birthplace of Heineken and coincidentally also KLM. For Pic Your Travel we carefully chose Away3D after playing around with alternatives. The technology allowed us to quickly produce a highly performing campaign within an extremely short timeframe we had available. To give an idea: most of the production was done in 3 weeks. One of the challenges for us was to make it responsive with high-resolution textures. You are able to zoom in on the globe and therefore the textures need to be (somewhat) crisp on the lowest zoom level. One texture will not cover the globe in this level of detail due to GPU texture size limitations. We divided the globe in 8 different segments and created the UV-maps using 3ds Max before compressing them to ATF textures for Away3D. Another challenge was to make the markers on the globe perform, not only when there are 1000 markers but also when there are 50.000 markers. To do this we generate all of the markers on the globe and then blend them together as one mesh so we can animate it as one object.